The city of Carlyle (population 3,406) is located in southwestern Illinois in central Clinton County. U.S. Route 50 intersects with Illinois Route 127 in Carlyle. Carlyle Lake sits just to the northeast of town and feeds the Kaskaskia River which flows past the east side of town. The Baltimore and Ohio Railroad also makes its way through town. Before you current Carlyle fans get riled up, this page is for those who remember the ORIGINAL Carlyle High School. We know that your current Carlyle High School is alive, well, and going strong today. We are aware of the State Championships you have won in the boys sports of baseball (1981), basketball (1989), and football (1989) as well as the girls incredible three straight State Championship game appearances from 1995 - 1997, winning the title in '96 and '97. GREAT JOB!! 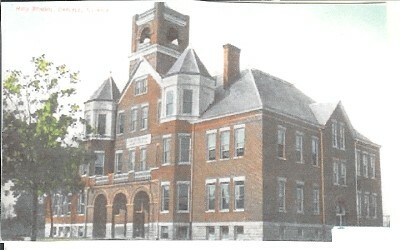 This page is about the Carlyle High School building of 1900 - 1955. About the Carlyle High School which was renamed Carlyle Community High School in 1943. It is about the Carlyle High sports teams which were called the Carlyle HS "Kaskaskians". Yes, like the Neoga Township High School page on this site, this is for the old-timers who still savor their time and fond memories in the old "twin tower" Carlyle High School building (pictured above) which was demolished in 1963. The memories and emotions of these Carlyle High School alumni are very real and are here to be honored. The athletic accomplishments of the teams before the name change to Carlyle Community High School (1900 - 1943) will be listed, though technically they are all a part of the history of Carlyle and its current High School. If you have any memories of the "Glory Days" of the original Carlyle High please e-mail and share them with the newer generation. "The last year in the "old" building was 1954-55 I was the coach then. The school nickname when I arrived was the Kaskaskians. We had outstanding athletes although I do not have the basketball record handy. I was only in Carlyle one year- moving to coach basketball at Pittsfield the following year where I became principal. I fondly remember the names of Duane Zachry, Jerry Essington, Jerry Trickey, Donald Wells and Donald Winn as the starting five in 1954-55. Colman Winn was Supt., ____Reid was Principal (moved to Sandoval where he died in a tragic fire). Richard Greene, coach in 1953-54 became principal at East Moline High School. I was principal at Quincy Sr. H. S. for 18 years, retiring in 1985. C.L. Harris was listed as a previous coach. He was a math teacher at Carlyle who was also a premier basketball referee in the state." Thank you to Coach Heitholt!! Thank you to Joann Higgins Coleman and Beryl Crocker Durbin for providing information and photos for this page. * Enlisted in Army Air Corps, 1953. * Received two Distinguished Flying Cross medals. * His plane, Red River Queen, has been put on display at Fairview Park in Centralia. * He is buried in Arlington National Cemetary, Washington D.C.
"I thought it was interesting that the school song was written by a Carlyle H.S. graduate,and that the song is still used to this day; 90 years later!"